Nestled at the foot of Crowsnest Mountain in a unique setting of old growth forests and alpine meadows, we are located in the beautiful Crowsnest Pass just 220 km southwest of Calgary in Southern Alberta. 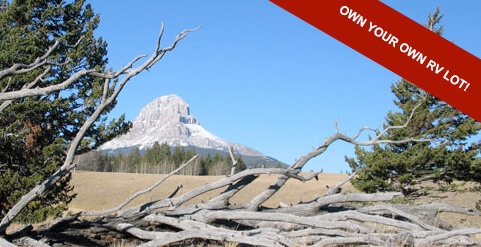 Crowsnest Mountain Resort offers you a great camping, cabin and spa experience in a spectacular Rocky Mountain setting. Our year-round, long term RV-sites are equipped with all services, including public washrooms, showers and coin operated laundry facility. Looking to lease your own RV-site for 35 years? We are the place for your RV or Park Model! The one bedroom cabins offer room to stay for up to four people (2 adults & 2 kids) in a bright and open design, with in-floor heating, satellite TV, kitchenette, full bathroom and a beautiful little porch to enjoy the views. Your stay includes the use of the outdoor cedar sauna as well as the large public fire-pit!